EcommerceKey is a pioneered online web designer firm in the global niche that accomplishes the dreams of owing thriving online businesses via our rich and advanced product designer applications. We build custom-made internet based applications using HTML5, jQuery, Ajax, MySQL database and along with use of scripting languages. We are a valuable name in today’s design industry for building exceptional and remarkable custom-made product design & applications for diverse business needs. We let your customers do what they actually need for, by going through in-depth business analysis and working on the same by putting life to it. Being adept in the multifarious product designer tools, we assure to meet the ever-evolving business needs of our esteemed clients. The benchmarks of our top-notch online design tool are the functionality, user-friendly interface, numerous qualitative features, flexible & adaptive structure that make us an offshore product design tool service provider. In order to uplift the production and business position, we cater the superlative online design tool to fulfill the clients’ and their end-users’ special demands. Image mask, image filter, low resolution warning. Multiple image upload formats (JPEG, SVG, AI, PDF, CDR, etc). Facebook import, Vectorize image, White removal. 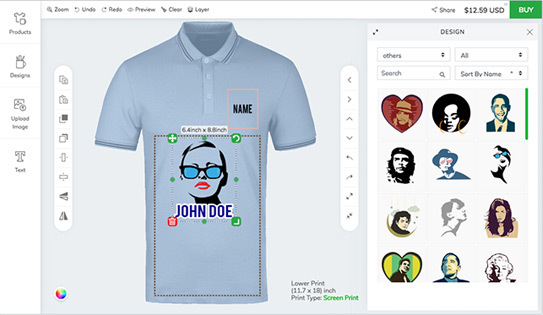 Realistic preview, Laser engraving (glass, metal, wood), Embroidery, 3D preview. Ready to use templates, Vector clipart designs, fonts. Supports all types of products (T-shirts, wide format signs and banners, team jersey, sticker, labels and more.). Supports all types of decoration process. Decoration process selection, multiple product sides and color variants. Shapes, QR codes, Hand draw, Layering, Real Time price calculation, Save and Share, Notes.